Rumors are flying around today that chip giant Intel (INTC) may revise earnings guidance to the upside this afternoon after the market close. Shares are +3.66% on big volume. Certainly a possibility, given its conservative inventory position. 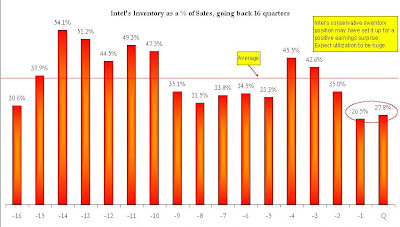 A rebound in the PC market combined with lean inventories like these could make for a very nice gross margin scenario. "One number that caught my eye was inventories. As of December 09, Inventories as a % of revenue was 28%, versus 46% a year ago. Intel is entering the new year LEAN, which looks to me like a potential for upside on margins."